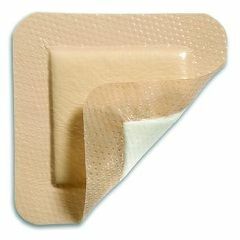 AllegroMedical.com presents Mepilex® Borderwhich is an all-in-one foam dressing proven to minimize patient pain and trauma to the wound and surrounding skin. Mepilex Border has been designed to create an optimal healing environment for moderate to high exuding wounds such as pressure ulcers, leg and foot ulcers, traumatic wounds, and other secondary healing wounds. Mepilex® Border effectively absorbs and retains exudate and maintains a moist wound environment. The Safetac® layer seals the wound edges, preventing the exudate from leaking onto the surrounding skin which minimizes the risk for maceration. The Safetac® layer ensures that the dressing can be changed without damaging the wound or surrounding skin or exposing the patient to additional pain. Mepilex Border is proven to help prevent pressure ulcers when used in addition with the standard pressure ulcers prevention protocols. Safe. Effective. EASY ON SKIN. Promotes Healing. Easy To Use. Emergency Preparedness. Keep In The Trunk. Outdoor Activities. Quick Fix. Keep In The Medicine Cabinet. Long Term Use. MY HUSBAND HAS A HOLE THE SIZE OF A HALF DOLLAR, DUE TO ORAL CANCER, CHEMO AND RADIATION IN HIS CHEEK. (THIS WILL BE THERE FOR THE REST OF HIS LIFE) WE USE THESE TO PUT OVER THE HOLE TO SEAL IT SO NO AIR OR LIQUID WILL LEAK OUT. WE USE 2 SIZES, 3X3 AND 4X4. WE HAVE USED THEM FOR 2 1/2 YEARS. THANKS FOR THE PRODUCT. Outdoor Activities. Long Term Use. Daily user with multiple removals and replacements. Mepilex Border bandages work well and provide excellent leakage protection. Very comfortable and easy to use. Lasts for 5 days on wound. Hard to find thru pharmac. Keeps pressure off foot ulcers to prevent infection and further abrasion. Can be used over again for 3 to 5 days. I have sensitive skin and most adhesives take off my skin, but these did not. These were great for long-term use. Although they are on the expensive side, they are worth every penney! Plus, they had the best price on the web! Easy To Use. Promotes Healing. Effective. Safe. Good Value. Durable. user friendly. Novice First Aid Skills. I'm a quadriplegic and I'm in my wheelchair between 14 to 16 hours a day. I got a skin tear near my tail bone. These pads were a life saver as far as the spot healing without staying having to stay in bed all day. Does the Mepilex Border Foam dressing come in 2x2? which side to put next to skin, sticky or not? Put the sticky side on your skin. The adhesive used in this product will not tear thin/fragile skin. I use it on my fathers diabetic leg all the time. Other band-aids rip the skin when I take them off, this will not. I just dressed a fairly dry, very shallow pressure ulcer using Mepilex for the first time. I put hydrogel on the wound bed, to make sure it stayed moist, since this is an absorbent dressing. Does that make sense? We used these for a pressure sore on my son's hip per a wound care nurse's instruction. It was suggested that we put a small amount of petrolium jelly around the outside of the sore only to keep the surrounding skin protected. We also used Medihoney on top of the sore to help keep it clean and help it heal. Once the sore was no longer draining the nurses advised us to take the bandage off prior to showers and reuse it. We would be able to get a few day's usage out of it. They are expensive little buggers, but well worth it as they work like a charm. I just want to make sure I read right, there are only (5) bandages per box? Yes, at least there are in the 10cm X10cm size that I bought. Can you get the mepilex dressing wet? I have used these for ulcerated sores on my leg and was able to shower with them on and had no problem. Also, my wound care therapist told me I could just lift the edge and put new colagen under it and reuse it. On a 4 x 4 border dressing what is the actual size of the gauze area? The area of the bandage that covers the wound is 2.5 inches by 2.5 inches. The size of the gauze area on the 4x4 is 2.5 x 2.5. How many of these are in the 4x4 box? There are 5 bandages in a box. There are 5 dressings per box. Are they biodegradable? They fall into the toilet sometimes, so I need to know if they need to be retrieved. No, you need to retrive them. Sorry.